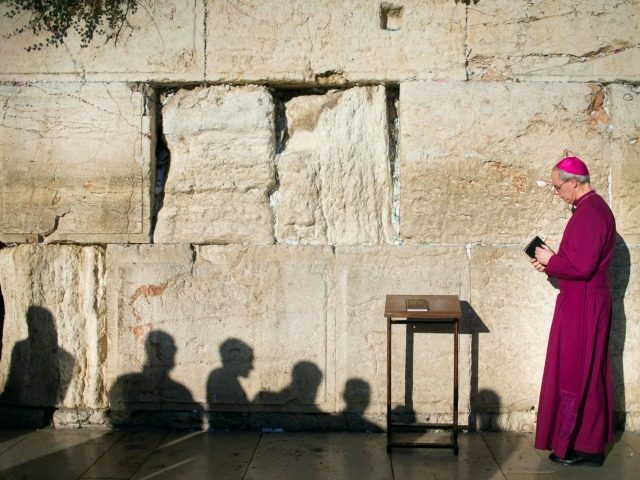 Bridges need to be built between Christians and Jews to help fight the rising tide of global anti-Semitism, the Archbishop of Canterbury, Justin Welby, said during his current 12-day visit to the Holy Land. Welby was speaking during a busy day in Jerusalem that included visits to the Church of the Holy Sepulchre, the most important Catholic site in Jerusalem, the Western Wall, Judaism’s most holy site, and the al-Aqsa Mosque, Islam’s third holiest site. He was accompanied by the UK Chief Rabbi Ephraim Mirvis. The call for unity comes as anti-Semitism has been seen to be on the rise in Europe, as Breitbart Jerusalem reported last month. Jews in Germany particularly say they feel a “growing threat” of anti-Semitism, a parliamentary report said. They are “increasingly concerned for their safety due to everyday experiences of anti-Semitism,” reported the Independent Experts Group on Anti-Semitism. Meanwhile in the UK, a recent study shows anti-Semitic hate incidents are surging to record highs. The Community Security Trust charity said in April there were on average more than three anti-Semitic incidents per day in 2016. It reported 1,309 incidents last year, a 36 per cent increase over the year before. It is the highest total since the group started keeping records in 1984. Welby visited Israel as part of 10-day tour of the region, his first visit since 2013. He will also visit the Palestinian Authority and Egypt.